Catalog Page 39. 7" Nature Pals. Alligators, apes, red robins, cardinals, dogs and parrots. The Nature Pal collection has many animals. Choose from personalized alligators, rhinos, bobcats, beavers, gorillas, parrots, pink flamingos, owls, eagles and cows. The above pricing includes a one-color printed t-shirt. You can mix and match animals and shirt colors as needed. 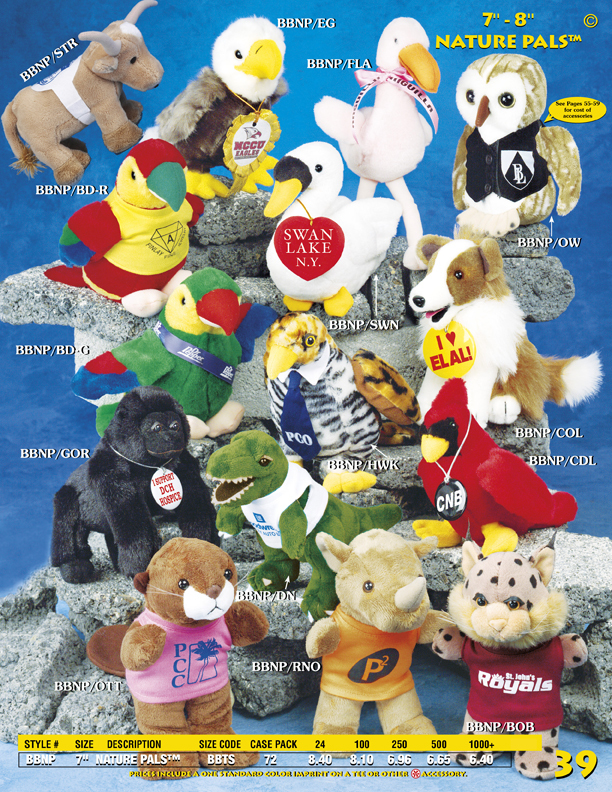 The 7" Nature Pals are great for tradeshow giveaways or school fundraising programs. We ship from New York and the lead-time for production is 10 -14 days.